Is This the Most Interesting Semiconductor Stock on the Market Today? 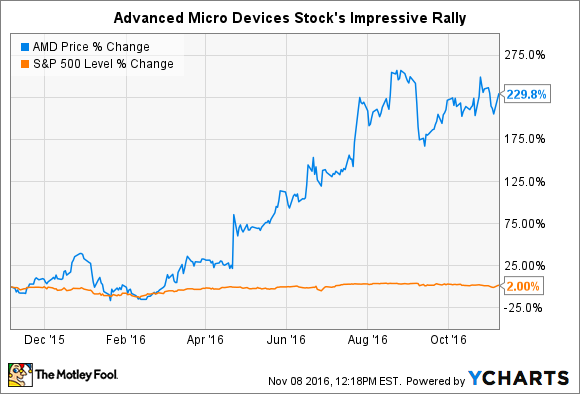 Advanced Micro Devices deserves credit for shifting its business toward important areas in the semiconductor market, but its soaring stock price also makes AMD shares look overvalued today. Pop quiz: What do you get when a company's stock rises 228% in a year while it also loses $548 million over this same period? My answer: A precarious valuation. As you'll see below, some of the newfound optimism bolstering AMD stock is deserved. However, the extent of a yearlong rally has also driven AMD shares to heights that the company's underlying business fundamentals seem unlikely to support, and investors eyeing AMD shares today should do so with extreme caution. Advanced Micro Devices occupies something of a precarious place in the eyes of many longtime semiconductor sector observers. Long the distant second fiddle to Intel in the market for the x86 microprocessors that power the PC industry, AMD has struggled to maintain consistent profitability since the turn of the millennium, which has had disastrous results for its volatile stock price over the long term. AMD Revenue (Annual) data by YCharts. In recent years, though, AMD experienced something of an unexpected renaissance. The growth in graphics-intensive computing tasks related to self-driving cars, big-data imaging, virtual reality, and even high-end video games drove a surge in demand for the graphics chips made by AMD and NVIDIA (NASDAQ:NVDA). The two GPU specialists differ in one essential characteristic: NVIDIA has traditionally occupied the high-end, high-performance piece of the market, while AMD has offered more affordable, mass-market chipsets. And its status as the everyman's GPU maker has proven to be an especially large benefit to AMD today. For example, it recently introduced the first $200 GPU -- the Radeon RX 480 -- a feat that could help lower the cost a VR-quality computer to around $600. Since the cost of many VR-ready PCs can run well into the thousands of dollars, a compelling mix of price and performance has fueled market-share gains for AMD in the market for PC graphics chips, even as the market for PC GPUs as a whole continues to decline. To counter this success, AMD's rival NVIDIA recently introduced its own $200 graphics chip design, the GeForce GTX 1060, and it's this kind of behavior that may threaten AMD's prospects in PC graphics chips. The broader implication here is that NVIDIA is willing to devalue its traditional high-end chips to defend its market share, and that doesn't bode well for AMD's continued surge in this space. AMD has also been able to translate its abilities in both CPUs and GPUs to create single systems on a chip (SoCs) that can handle most core computing tasks for video game consoles like the Microsoft Xbox One and Sony PS4. The company indeed deserves credit from investors here: It appears to have established a profitable niche in console SoCs. 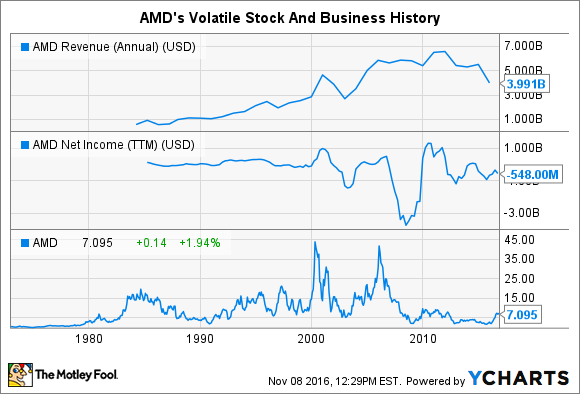 However, despite AMD's clear opportunities and recent successes, shares have ventured into the realm of the overvalued. AMD's business has indeed improved, but its soaring stock price seems difficult to justify, even looking to the medium term. For context, AMD's current lack of profits this year and its expectation for continued losses next year give it negative current and forward price-to-earnings ratios. Looking further to other commonly used valuation metrics, AMD's enterprise value-to-EBITDA ratio is also quite high at 236. The common thread should jump out here. AMD's expected lack of profitability this year and next year doesn't inspire a lot of faith that the company can sustain a $6.8 billion market capitalization. To be sure, a large portion of AMD's current-year losses stem from the $340 million charge related to its amended chip-fabrication deal with its former manufacturing arm GlobalFoundries. However, this one-time charge doesn't affect AMD's profit outlook for next year. Thus, its continued estimated losses make me question whether investors are willing to wait until 2018 for profits to appear. To be sure, AMD has done a great job tapping into the newfound demand for gaming-quality graphics chips. However, NVIDIA's ability to move down-market in that area adds a clear element of risk to AMD's ability to continue to steal market share. What's more, as console gaming platforms seem likely to vie with PCs as virtual reality gaming platforms, it seems possible that AMD's two core revenue growth catalysts could find themselves in direct competition in the years to come. The overall point is that AMD's stock rebound has certainly been justified -- to a degree. However, given the company's plausible lack of near-term profits and its positive but evolving competitive position, a continued rise in AMD stock seems unlikely in my estimation.